Minister of State for Finance, Alhaji Yerima Ngama said Thursday that a total sum of N254.96 billion had been extended as grant to export manufacturers between 2005 till date. This, he said, was aimed at encouraging manufacturers and producers of export crops to increase their exports under the Federal Government's Export Expansion Grant (EEG) scheme which is targeted at economic diversification. He added that the value of total non-oil export had risen to about $3.2 billion from only about $100 million in 2005 as a result of the grants. Addressing journalists in Abuja at the end of a meeting of the Ministerial Committee on the implementation of the EEG scheme, Ngama said the scheme had been of immense assistance to manufacturers. 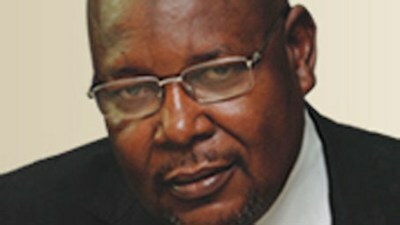 He said: "As at December 2005, total export of non-oil products just came to $100 million. But as at the end of 2011, total export was $3.2 billion. So if you compute, you have over 300 per cent growth in export. So it is evident that the EEG scheme has been successful." He, said, however, that two major reviews were underway. According to him, the first would be to categorise the manufacturers and producers of export goods in order to take the peculiarities of every sub-sector into properly consideration. The committee is also looking into how to compensate and determine computation of the grant. Its agreements are however, to be submitted to the Federal Executive Council (FEC) for approval. The minister said the proposed review was base on the "Realisation that the scheme has been successful and our manufacturers and producers of export goods have performed so well that even the threshold that we put for them before you become elligible to benefit. They've met all these thresholds and therefore, they want the standards to be enhanced. "You know when somebody is doing well, you have to lift the standard and one thing we have agreed here is to actually move this threshold in order to move the minimum acceptable threshold higher and they have assured us that they are going to meet it and even beat it. And I think we have to congratulate them for what they have done and even shifting the goal post because they want to do more." But the minister declined to reveal what the current threshold is and what was being proposed. "The performance has been so well to the extent that we have agreed to move the goal post because they think whatever you say they should do, they can even do more." He said: "The Nigerian economy needs to be diversified and the good news is that the transformation agenda of government of President Goodluck Jonathan is working and the evidence is the decision we reach today." The ministerial committee is currently the highest policy making body as far as managing the EEG scheme is concerned-and it reports directly to president through the FEC. In an attempt to boost cargo business and export in Nigeria, Stella Oduah, Aviation minister, said recently that along with remodelling and building of airport terminals, the ministry would secure N106 billion from the Chinese bank to build about 11 Cargo/Perishable materials terminals, with six of them to be sited at airports in the North. Her plans, according to Yakubu Datti, general manager, public affairs of Federal Airports Authority of Nigeria (FAAN), is to make Nigeria a leading exporter of agricultural produce, through the nation’s airports, in line with government’s transformation agenda for the aviation industry. He said the authority has commenced the repositioning of cargo business in line with its statutory function of engaging in economic activities that impact positively on the growth of air transport in Nigeria as part of the ongoing restructuring of the aviation sector. According to him, “the present cargo traffic figure for year 2011 at the Murtala Muhammed International Airport stands at about 171.6million metric tons per annum, whereas Manchester Cargo Airport in the UK handles about same number at around 170million metric tons cargo annually. The airport is already targeting about 250million metric tons by year 2015 according to information from the MCA websites. The present strategy by FAAN will give room for the expansion of cargo traffic figure to about double by 2015. “By the time this project is realised, FAAN would have become a major player in the cargo business comparable to international airports as Schiphol Airport, Amsterdam, Frankfurt Airport in Germany and London’s Heathrow Airport”, he said. Datti noted that among the strategies adopted in fulfilling this objective is the elevation of the sector to a full scale directorate. The new cargo directorate will be responsible for generating a blueprint for turning the cargo business to a profitable venture as it is done globally. The directorate will also be responsible for implementing changes and monitoring the application of relevant resources to achieve result. He said the new initiative will involve the building of massive terminals which will have several perishable cargo warehouses and other cargo infrastructure; will help to boost the economy of the country in terms of speedy turn around and safe delivery of goods and services. 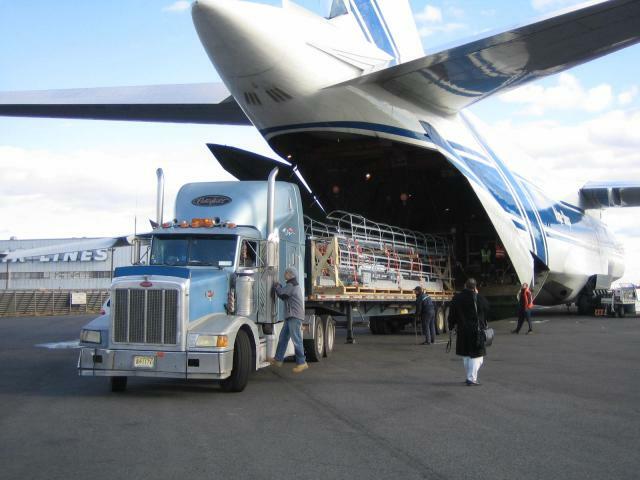 Although, the volume of Cargo export is still very low compared to import level as the country is yet to fully develop that aspect of business, however, FAAN, says it targets over 343.2 million metric tons of cargo traffic through the Murtala Muhammed International Airport by 2015 as it begins to develop the business for positive impact on air transportation. Rowland Ofulue, director, Cargo Development, FAAN, at an interactive session with the representatives of international cargo airlines and members of the Association of Foreign Airlines’ Representatives recently said the creation of a new directorate of cargo development in FAAN was among several strategies adopted by the Federal Government to steer the nation from being an oil and gas dependent economy to a multi-pronged economy that will create more jobs for Nigerians. He said that the new directorate was poised to create an enabling environment that will boost cargo development at major Nigerian airports, where more emphasis had been laid on passenger movements and other related businesses. Ofulue informed the group that the Federal Government had concluded plans to build new cargo terminals in twelve airports across the country and invited them to take advantage of this huge investment to contribute to the growth of the country’s economy, through increased air cargo operation. He also said that an agro-allied economy can evolve from the development of the cargo terminals being planned nationwide, adding that a lot of perishable food items that are produced in this country could be exported through the airports as it is done in neighbouring countries that rely solely on such exports for the sustenance of their economies. We are urgently in need of the products listed below from suppliers all over Nigeria. You can either supply us locally or we get an export contract for you to export them to our buyers under our supervision. Our specifications, payment terms, pricing and other terms and conditions will be sent to you as soon as we get your request via the contact details stated below. Contact Details: Interested local supplier or exporters should contact us via info@3timpex.com and +234 803 6522 946. Payment Terms: Payment to be made within 2 working days after delivery and confirmation of quality and quantity. 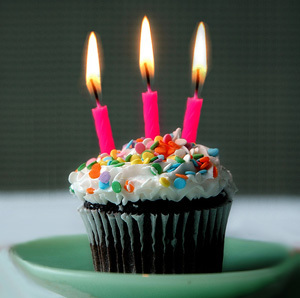 EXPORTING FROM NIGERIA BLOG IS 3 YEARS OLD !!! Dear readers, we (3T Impex Consulting ltd) are very glad to inform you all that this blog is 3years today November 26, 2012. We want to first of all give all glory to the Almighty God who have given us the privilege to use this platform to reach out to thousands of individuals that visit this blog on a monthly basis. 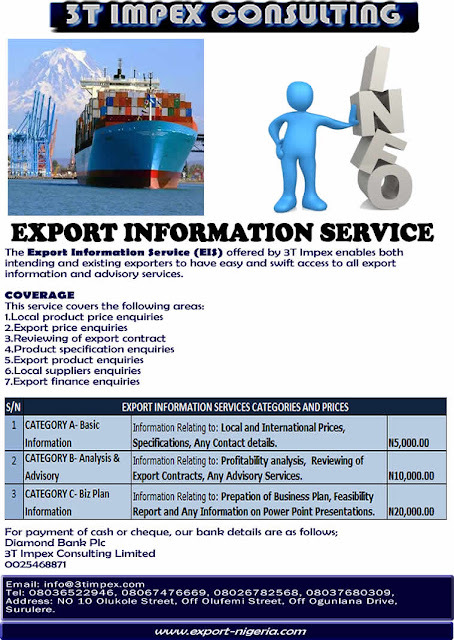 This blog, titled Exporting From Nigeria (exportnigeria.blogspot.com and export-nigeria.com) started 3years ago as an avenue to provide free Export information to people: firstly within Nigeria (to enable them know what can be exported and how to go about the export business ) and secondly outside Nigeria (to enable them know how to import from Nigeria or come into Nigeria to start export business). The impacts of the blog cut across different continents and groups of people (M.Sc Students, Businessmen, Researchers, Export Marketing Companies, Importers of Nigerian Commodities, Intending and Existing Exporters within and outside Nigeria) as evidenced on the comments of visitors on the blog. This blog have really come a long way within the past 3years. From inception till date, it has recorded over 230 people as registered visitors. The monthly visitors have increased from nothing to almost 5,000 per month. The monthly page views by these visitors have grown from zero to almost 10,000 as at last month. Our vision in the coming years is to use this platform to attract partners in Europe and America (just the way we already have one in Asia) who will work as sales agents for Nigerian exporters abroad. 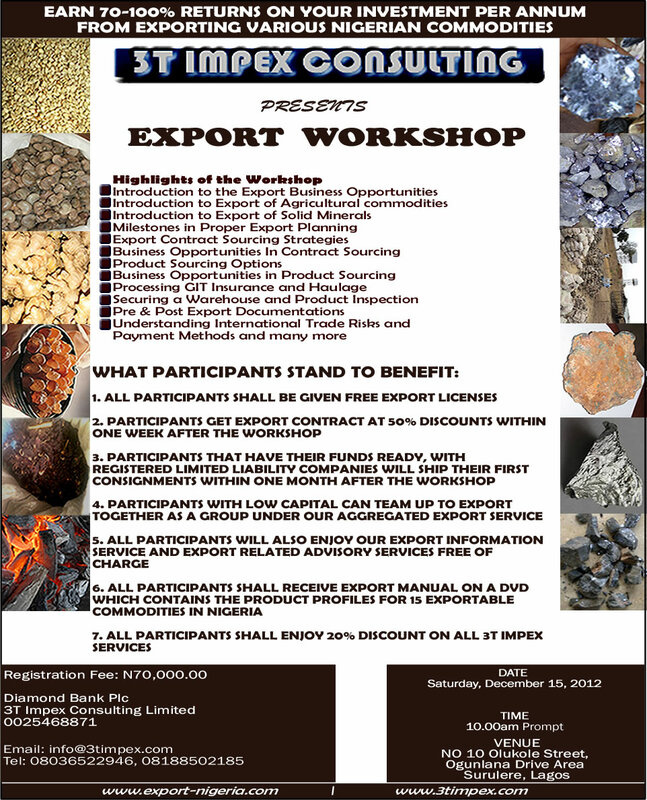 This partner will simply source for buyers of Nigerian commodities abroad, link them to us and facilitate the trade between these companies and exporters from Nigeria and they will also earn a commission in the process. We want to thank the Almighty God once again for His wisdom and our regular visitors for their interest and valuable contribution to growth and development of the blog. Long live 3T Impex Consulting Ltd !! Long live Federal Republic of Nigeria !!! Export Expansion Grant (EEG) is a post-shipment export incentive scheme that is designed to encourage non-oil exporters whose minimum annual export turnover is N5 million. It is a scheme designed to assist exporters to expand their volume and value of non-oil exports, diversify export markets and make them more competitive in international markets. It was established by the Export (Incentives & Miscellaneous Provisions) Act of 1986. It is being administered by inter-ministerial committee made up of the Federal Ministry of Finance, Central Bank of Nigeria, Nigerian Custom Service, Nigerian Export Promotion Council, and the Special Assistant to the President on Manufacturing Association of Nigeria and the private sector in general. Though the management of this laudable scheme has been a subject of criticism, to some extent, there has been some good side to it. Informed stakeholders like Femi Boyede, the CEO of Koinonia Ventures Limited (now technical adviser to the Minister of Trade and Investment on export) said “with the EEG, the non-oil export sector has grown at double digits growth rate compared to single digit growth rate of Nigeria’s GDP. This momentum has to be sustained and improved upon if Nigeria is to progress meaningfully towards achieving Vision 20: 2020. For him, unlike many other government concessions and subsidies, EEG scheme is for the entire non-oil export sector and not for any particular individual company or set of companies. A Senate Committee on Investment presentation at an interactive forum on diversification of the Nigerian economy through non-oil exports in May, discussed the disadvantages faced by Nigerian exporters, saying that “EEG is critical to offset several cost disadvantages faced by Nigerian exporters. The committee’s list of cost disadvantages include high cost of power and need to set up own infrastructure; high finance cost and lack of long term funds; high transportation cost; high labour cost due to lack of skilled workers and low productivity; high cost of doing business and loss of preferential market access to the European Union. For the Committee, citing UNIDO study, when benchmarking a number of Nigerian input cost factors with a panel of countries, which Nigeria competes with, it becomes evident that Nigeria has very high costs for the most important inputs. It said although this study was done for the textile industry, the results could be applied universally to the entire manufacturing sector in Nigeria. On cost of power, it argued that Nigeria is the highest among competing countries, adding that “the cost of short-term borrowing at 18 percent interest rate is a major international cost disadvantage for Nigerian manufacturers as the comparison clearly shows. Both India and Pakistan provide concessional funds to exporters at 3-4.5 percent points below above rates. Nigerian exporters face several disadvantages due to lack of an enabling environment reflected in policy implementation bottlenecks. The Senate Committee drew attention to China and India, two countries that are doing better than Nigeria because of government’s supportive policies. For China, the Committee said, “International practices as per WTO report (2006), China introduced an elaborate package of incentives to attract FDI and boost exports. Over 50 types of subsidies were notified to WTO. India aims to double its exports in three years. Its Foreign Trade Policy provides a package of incentives and these include, among others, Duty draw back (DEPB) scheme to refund all taxes and duties on exports; concessional export credit at 3 percent subsidy; tax holiday up to 10 years in SEZ; focus product and focus market scheme to offer higher incentives for specific products. India became the world’s 14th largest export nation with exports valued at US$220 billion in 2010. It also argued that EEG has made a remarkable impact to achieve the Transformation Agenda, listing growth in non-oil exports; employment generation; diversification into new markets, and encouraging exports to move through official channels as growth drivers. Non-oil exports increased by 400 percent under extant EEG policy regime (2005-11) while share of non-oil exports in Nigeria’s total exports, although small, has doubled in the last five years (2006-11). Agro-allied products drive Nigeria’s non-oil exports with cocoa and leather contributing about 50 percent of total exports. Over 11 million Nigerians are employed directly and indirectly in agro-allied non-oil sector, mostly in rural areas. Non-oil exports impact the lives of Nigerians in all the geo-political zones. Exporters have diversified the market base with entry to the US market in particular under AGOA. 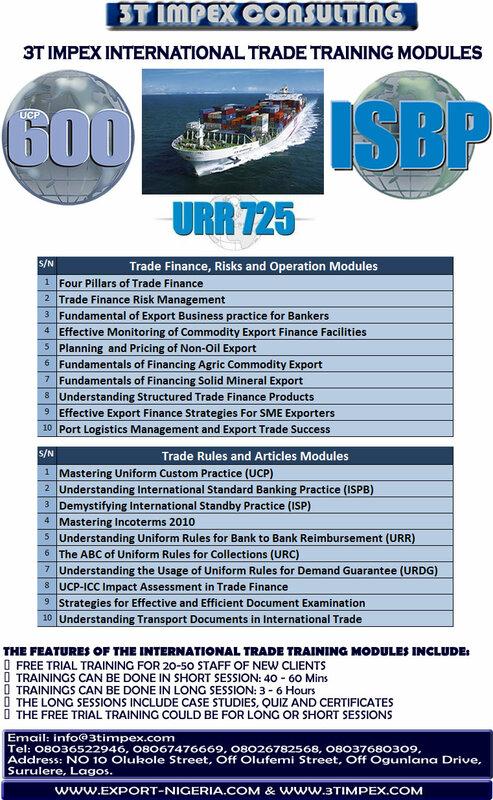 Present policy, according to the Committee, encourages exports to be conducted through official channels; 100 percent export shipments undergo pre-shipment inspection by private inspection agencies(PIA) to verify quantity, quality and value; all non-oil export proceeds are repatriated into domiciliary account with the commercial banks. CBN confirms repatriation and monitors the utilization of export proceeds for eligible transactions. The apex bank’s Annual report contains the list of Top 100 non-oil exporters. The EEG scheme has, however, been the weeping horse of stakeholders who strongly believe it is not being properly managed. The Senate Committee presentation highlighted some of the schemes drawbacks, saying: EEG disbursement involves cumbersome process spread over 12-18 months; Policy instability and discontinuity have crippled the non-oil export sector, and there are major policy disruptions in (2005-11. It faulted the 2005 blanket suspension of EEG and review by PWC and PCTM. Suspension of all incentives and concessions; review by Udoma Committee. 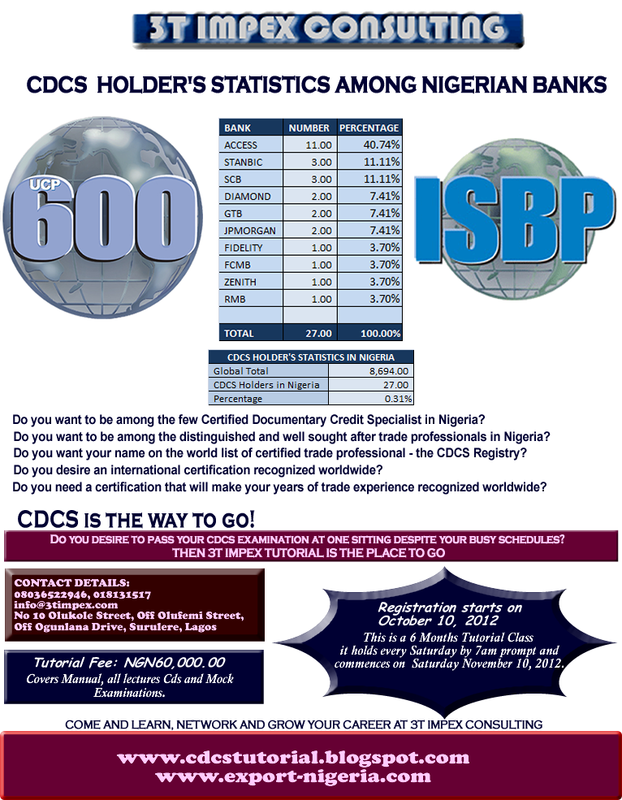 Customs Service alert to suspend acceptance of NDCC for duty payment, pointing out that policy instability and discontinuity have crippled the non-oil export sector and is affecting Nigeria’s status as a reliable international trading partner. The Leather and Allied Product Manufacturers Association of Nigeria (LAPAN) was recently at the forefront of a crusade that the EEG scheme should be scrapped because “it is impacting negatively on the Nigerian skin and leather industry”. The Association argued that more than N300 billion has been distributed since the introduction of the grant, but the money has not delivered any positive outcome. The group added that “there is no sign of development or any change in the export infrastructure”. LAPAN said a single tannery in Kano has bagged a grant of over N35 billion over the last five years with no evidence of any form of improvement in the tannery. “Foreigners, who pass the benefits of the grant to other countries, have benefited the most from the said grant”, it noted. To some industry players, like Kamilu Ila, the EEG scheme is killing the industry, especially those industrialists with feeble financial clout. According to him, the many negative effects of the grant have thrown him and some 40 other industrialists out of business. The National Association of Hides and Skin Dealers (NAHSD) would not however, agree with LAPAN. Scrapping the scheme, according to the association, “will be injurious to the economy”. Chairman of the association, Ali bdu Gezawa said his association “represents the interest of ordinary Nigerians whose survival depends on activities in the hides and skin value chain”. Olusegun Aganga, Trade and Investment Minister, however told Business Day in Lagos that government expects an improved and more effective EEG, explaining that “when you are running a scheme, you must get to a point where you appraise the situation. You want to know if it is giving the desired result. You want to know the things that you need to improve or change”. He continued: “There are so many stories surrounding the EEG that I need to check. I need to confirm which of these stories are right or wrong. And if they are right, what do I do about them? He said his ministry has undertaken a comprehensive review of the scheme. “One was an inter-ministerial committee looking at it. I had a meeting with all exporters in Abuja recently to talk about my strategy going forward in terms of trade and also to hear more about the points of view of exporters. “So, we should have an improved version of the scheme at the end of the day. We want to make sure it is properly classified. Secondly, we want to make sure that the administration is very transparent and that there is accountability across the board. And we want to see close monitoring,” he said. Business owners across the country, including manufacturers and many others engaged in non-oil business, are currently stuck with about N60 billion worth of NDCCs, an instrument of EEG scheme. According to a Central Bank of Nigeria’s data, in 2011 alone, non-oil export in Nigeria accounted for N485.2 billion. Industry analysts told Business Day that considering the cumulative figure from 2005 when the scheme was created up to now and considering government’s current drive to boost non-oil exports, the N60 billion stalled EEG certificate in question is conservative. Holders of the certificates allege that Customs Service officials are spoilers as they refuse to honour NDDCs presented by businesspersons in defiance to directives from the supervising ministry. Thus, as good as this scheme may be, lack of synergy between departments of government is currently the scheme’s killing pill. In a letter addressed to the Comptroller of the Nigerian Customs Service, dated December 1, 2010 and signed by Aganga as Minister of Finance then, the Customs Service boss was directed to accept the NDCC for payment of import duty for industrial machinery and raw materials. The Comptroller General had earlier issued orders to its formations to restrict use of the instrument. And only recently, Minister of State for Finance, Yerima Ngama and his Trade and Investment counterpart, Samuel Ortom, appeared before the Senate Committee on Investment to explain the workings of the EEG and NDCC. The committee regretted that the EEG scheme, introduced in 2005, designed to ensure export support incentive scheme currently operational in the country, was beset with challenges thereby crippling the essence for which it was introduced. The committee therefore, agreed that the scheme should be reviewed in order to bring it in line with global best practices. It particularly asked the Nigerian Customs Service to honour the NDCCs. The committee’s request was sequel to complaints by some beneficiaries of NDCCs that some operatives of the Nigerian Customs Service were not honouring the NDCC, leading to difficulties in import transactions. In their reaction, Representative of the Comptroller General of Customs Service, Abdullahi Diko said the Customs Service was open to honouring the NDCCs but that “this leads to loss of revenue to the service since it does not count as part of the revenue collectable by the Customs Service”. Comments by industry analysts who are also players in the industry corroborate this argument. According to Shuaibu Idris, former deputy managing director, Dangote Flours Plc, the Nigerian Customs and the Federal Inland Revenue Service do not accept the certificates from importers in place of cash for payment of taxes and custom duty. This, he said, “is most unfair to exporters”. For him, “government needs to streamline the operation by directing its agencies to accept these certificates from holders before they become useless. Holders normally give ‘discount’ to government officials which ranges between 5 percent and 15 percent of the face value of each certificate. This discount is not enjoyed by government”. He said customs only accepts not more than N500 million of such certificates monthly for duty payment, adding that a “few exporters have cornered this amount!”. For him, there is a need for a total overhaul of the scheme. The EEG, according to him, needs to be reviewed because some of the conditions favour foreign companies. “The consultants who handled the incentives were not trade experts and as such, there were bound to be some issues. When the next review is done, it should be subjected to stakeholders’ public hearing to ensure that all stake holders have their interest protected. Given that this is the only export incentive working, it requires urgent attention before it turns to a disincentive”, he said. The Manufacturing Association of Nigeria (MAN) in its Blue-Print on manufacturing released recently, said that the NDCC should be accepted by the Customs in accordance with the EEG guideline for the payment of import and excise duties, adding that the EEG should therefore, be implemented in accordance with the approved guidelines. MAN also advised that the Nigerian Export Promotion Council (NEPC) should be strengthened and better funded to enable it meet some of its challenges such as holding regular meetings of EEG Implementation Committee to avoid backlog of claims. The Senate Committee on Investment advised that existing policy should be continued and reviewed to make it more effective towards the realization of the Transformation Agenda. They say NDCC should be accepted for duty payment; the report of the EEG review committee by Ministry of Trade and Investment should be considered by the government to make the scheme more effective; backlog of EEG claims for 2010/2011 and even past years 2004-2011 should be processed, just as NEPC should improve its customer service delivery, and NDCCs should be recognized as revenue generation for Customs. NEW DELHI: World coffee exports increased by 3 per cent to 107.8 million bags during the recently ended coffee year, which ended in September, due to increased shipments from Vietnam, Indonesia, Mexico among others, as per the data released by International Coffee Organisation (ICO). In 2010-11 crop year (October-September), the worldwide shipments of the brew stood at 104.7 million bags (of 60 kg each). Exports in the 2011-12 coffee year registered an upward trend in Vietnam, Indonesia, Mexico, Cote D' Ivorie, Costa Rica, Ecuador, Guatemala, Nicaragua, etc, International Coffee Organisation (ICO) data added. However, the shipments of the brew plunged in major exporting countries of Brazil, Columbia, Ethiopia and India, it added. In coffee year 2011-12, exports of Arabica totalled 66 million bags as compared to 67.8 million bags last year, whereas robusta exports amounted to 41.8 million bags compared to 36.9 million bags in 2010-11. 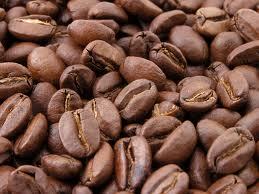 Global coffee exports appreciated by 3 per cent to 7.94 million bags in September 2012 compared with 7.71 million in September 2011. There are indications that Nigeria’s trade policy has placed it above other countries in the sub-Saharan Africa as it accounts for about 30 percent of the entire exports of the Sub-Saharan African countries to the outside world. However, the international financial advisory firm, Renaissance Capital, which made the disclosure said the sheer volume of Nigeria’s exports makes the country vulnerable to the current global economic downturn. Rencap, in its latest report titled “Sub-Saharan Africa: Export Patterns-How Trade Dependencies Have Changed,” said Nigeria is SSA’s biggest exporter to the rest of the world. “Almost 30% of SSA’s exports outside the region originate in Nigeria, and three countries – Nigeria, SA and Angola – dominate extra-regional exports, accounting for 70% of the total, implying that SSA’s exposure to a global downturn through trade is concentrated in these three countries. We believe the impact on Nigeria and Angola is mitigated by their limited exposure to the EU. 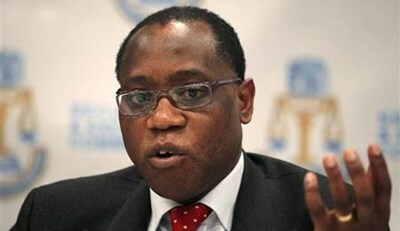 Nigeria is said to have exported non-oil products worth over $1.40 billion this year. The figure represents about 11 per cent decline from the over $1.43 billion recorded over the same period last year. Value of the exported goods for January was put at $161.6 million dollars compared to $307.2 million realised a year ago. The Executive Director, Nigerian Export Promotion Council (NEPC), David Adulugba, had put the value of non-oil export for the first and second quarters of the year at $660.1million and $686.2 million as against $818.8 million and $676.2 million recorded for the same period in 2011. According to him, Nigeria exported non-oil products worth $242.9 million in February, this year compared to $273.6 million recorded in the same period last year, adding that Nigeria exported non-oil products worth $255.7 million and $220.6 million in March and April, this year, as against $237.9 million and $250.6 million recorded for 2011. Meanwhile, the nation’s growth was said to have softened in 2012 to less than 7% on the back of a slowdown in the non-oil sector’s activity, particularly Agriculture and wholesale and retail trade, owing to insecurity in Northern parts of the country. Rencap explained that floods have also threatened to further undermine growth in 2H12. “We project growth of 6.3% in 2012, down from 7.4% in 2011. Floods also increase the upside risk to inflation, with inflation likely to return to the low double digits and the policy rate likely to remain flat at 12% in the short term,” Rencap said. In a similar vein, watchers of the unfolding scenario in the global market said trade is the channel through which SSA experiences the most severe effect of a global downturn. As at today, China is now SSA’s biggest bilateral trade partner. This is because the country in 2009 surpassed the US to become SSA’s biggest trade partner. It, however, singled out countries (such as Angola) with greater exposure to emerging markets (EM), particularly China as those that will not be unaffected, given the softening of growth in these economies, which has challenged the decoupling argument. “The US fiscal cliff implies that SSA economies that are big exporters to the US may experience slower demand in 2013,” the report stated. Sesame seed market is facing a new worldwide scenario: The increasing demand has overcome the production capacity of main growers. The use of sesame seed has spread in many new countries as part of daily diet, in different gastronomic cultures, in different plates… Some derivatives of sesame seed, like sesame oil, are also widely used in personal care and cosmetics industry, and for pharmaceutical purposes. The reason for the increasing use for sesame seed is the variety of applications it has now, and the raising consumption in developing countries like China, India, Malaysia, Indonesia, etc.,where people with higher income now are able to get better quality food. Monsoon season in India lasts 4 months and represents 75% of the annual rains. This rainy season started in June and it is about to end, with 22% lower level than the regular average. Indian authorities have made an official declaration of drought in that country.They are waiting for rains to improve in the next weeks, as this is the only source of water for more than half of the production lands. On the other hand, and considering all conditions previously mentioned, growers are expecting sesame seed crop season to be delayed in at least one month. We have received weather reports from the USA indicating also droughts and bad weather conditions for oleaginous seeds production states.Last year was recognized by Mexican authorities as the driest in the last 70 years. This year, on the other hand, has been the one with the highest level of rain in the last 6 years.Both situations do not allow the farmers to have constant production levels and be efficient. 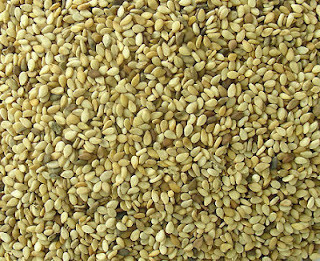 Sesame seed crop is based on rainy season, but too much water may damage the seed. This situation may delay Mexican crop this year. South America has been facing a season with rains above the regular level. In some regions with high lands, like Peru and Bolivia, cold weather has been so intense that part of their crops was lost. Late rainy season has damaged a lot of sesame seed in the farms(they will have sesame seed, but it would be low quality). Africa has had favorable weather conditions for sesame grow. The amount of land cultivated with sesame seed has increased, and the yields have been better every year.Nevertheless, the major part of their crop is addressed to cover China needs. China has developed different African countries as raw material suppliers to complete its requirements that are bigger than its internal production capacity. Some weeks ago we started to detect movements in market, mainly prices rising up because of low stock levels, high demand from Eastern countries and the news about bad weather conditions in production areas. Sesame seed price has gone up between 20 and 22% in the last weeks. This price change was also supported by the last Korean tender. Korea bought 12000 tons of sesame seed unhulled, at prices 18% higher than in last Korean tender, and much higher than last year. 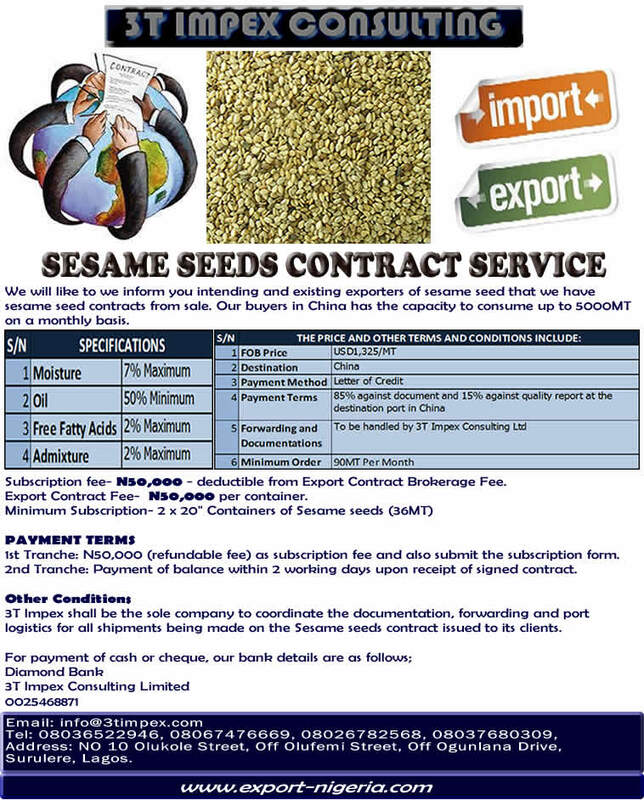 Those processing sesame seed in South East Asia are saving the very few seed they have left to offer it at expensive price in the next Korean tender. 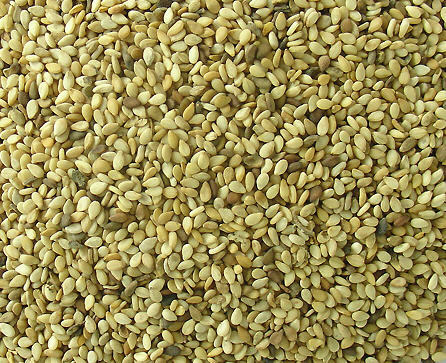 Regular sesame seed crop in China is estimated in 750000 Tons per year. In the last years, the consumption of sesame seed in China has surpassed the supply, with an estimate of 1,000,000 tons. The difference between their production capacity and their needs is bought in Africa and in South East Asia. However, there are many rumors about a bad crop of sesame seed in China for this year (September / October), which will have a direct impact on price worldwide: If China produces 10% less than the year before, it would be the equivalent to the loss of the complete production of Latin America. Every time we found this kind of rumors in China, international prices go up. China, as we known, it is the biggest producer of Sesame seed in the world. not increased further thanks to its depreciated currency (Rupee), whose value has decreased 18% against the US dollar, compared to August 2011. How long is it going to last the Ruppe with that devaluation level? It is hard to predict, India is a country with deficit in production of basic food, like seeds, oils, grains and beans, and they can not live with such a weak currency all the time, they think the government will help Rupee against dollars in the next months. It is important to remember that India produces 320000 tons of sesame seed per year, and last crop was close to this level. 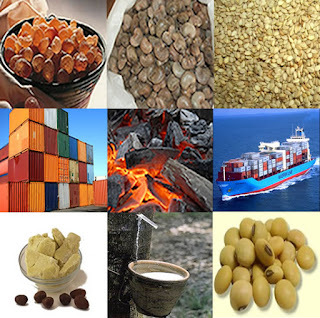 Annual production of several African countries as reached 200000 tons. African countries have a strong commitment with China, who has financed African infrastructure in the last decade. By buying sesame seed and other products from Africa, China is securing that they will have funds to pay back their debt. In Mexico, farmers have been discouraged to grow Sesame seed. Prices of corn, sorghum, beans and other products are much higher in the market; besides, farmers growing these kind of products (mainly corn) receive strong financial support from the government, which they do not see if they decide to grow sesame seed. We have been working with farmers to encourage them to keep cultivating sesame seed, by securing them the market and purchase volumes. The bad mood among farmers was increased by the damage that Joba Hurricane left in the farms last year (they had grown a lot of sesame seed and part of it was lost with this hurricane). Loans from government were addressed to corn and tropical fruits growers (which are more profitable products than sesame). This year we expect a crop similaror lower to last year, below the 20000 Tons. If this trend continuous, the price difference between Indian sesame seed (low quality / high microbiological risk), and Mexican sesame seed (high quality, good taste, minimum risk sesame seed), will decrease, making the Mexican sesame seed more attractive to industry. After a crop record 2 years ago, South American countries have suffered excess of rains in the last 2 crop seasons, and this made the average yield to decrease. This year Venezuela estimates to harvest 18000 Tons out of the 26000 tons they were originally programmed. Besides, big portion of the seed they got was damaged by the rain, and it may be lost. Season was also bad in Paraguay, estimations say that 15000 Tons out of the 36000 originally programed. We estimate a total of 50000 tons in all Sout America, (below the level of other years). We are currently facing a new scenario of rising prices, the expectations for season 2012 / 2013 are on high price. Some contact people we have in China and India talk about reaching the price levels we had in 2008, at $2800 / $3000 usd / MT). Those companies that booked contracts for the complete year are protected against this volatility and it is confirmed they made a great deal early this year. It is recommended to keep an open and constant communication with our company, in order to organize something together. We will be monitoring any possible change, to be ready to buy raw material in the best possible time.